Home > Louvre Roof Pergola > Why Should You Add a Louvre Roof System to Your Restaurant Patio? Adding up a Louvre roof to your restaurant’s patio can add an elegant look to your restaurant, as well as, adding more space to your restaurant’s area! A louvre roof system is a stylish and practical roofing solution that allows you to increase revenue by adding tablespace regardless of most weather conditions. There is a reason why people flock to their favourite bistros and cafes during the spring season. People like to enjoy their meal outside despite a light or moderate rain. You can even make it as a fun experience when it rains by offering a welcoming drink with an umbrella or use some other marketing techniques to attract patrons to your patio when it rains. With a push of a button, you can turn an uncovered patio into a rain-free protected area where Mother Nature will stay away. Your guest will continue to enjoy the fresh environment they anticipated when they first decided to sit out on the patio. Why should you consider Louvre roof system for your restaurant’s patio? You can adjust your patrons’ comfort to the elements by allowing maximum sunlight, diffused light and shade at a flick of a switch by angling the louvered pergola. The unique interlocking feature in the louvre roof systems protects your guests from the rain. It is suitable for Australian and other harsh climates as well. The flaps design provides good thermal insulation from harmful UV rays and sound reduction. With louvre roof systems you can reduce energy bills by controlling the amount of sunlight exposed on the outdoor space as well as promote ventilation. No matter whether you have gabled or pitched roofs or angled roofs or walls, a louvre roof system can be engineered to suit your restaurant style. Yes, it can be blended with the architecture of your restaurant. The louvre roof systems can be operated by a remote control that allows smooth operation of the louvres. The louvre roof system comes with a sensor that closes the louvre when it starts raining. In addition, these roofing systems can be connected to your home automation systems. Installing louvered roof pergola on your patio can increase your establishment’s visibility and attract more customers. This roof system makes it easy to create a climate-and light-controlled environment that will please any guest. Louvered pergolas are a wise decision for any business, as it provides a quick return on investment. 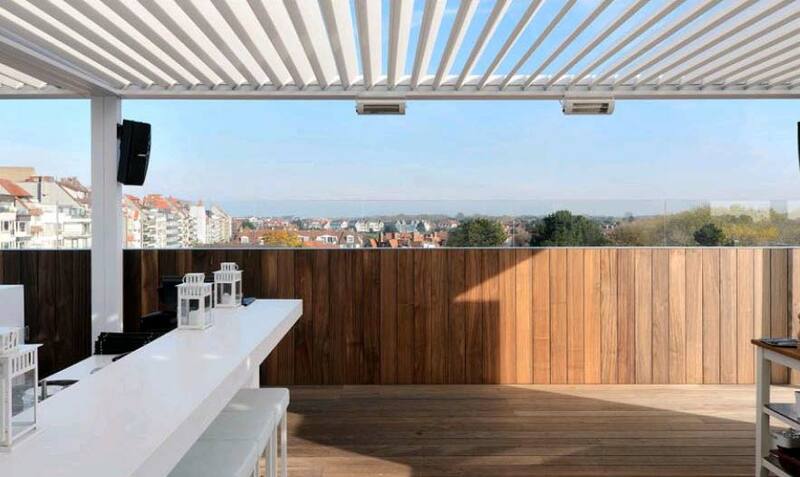 Restaurants or hotels or rooftop patios or any outdoor area you are looking for protection, increase comfort and style, with louvered roof system you create a better outdoor living.